Do you like being able to access what you want on the internet without Comcast, Charter, AT&T, or some other ISP slowing it down, blocking it, or charging you extra? Well, bad news: The FCC has begun a process that will — unless things change dramatically in the coming months — repeal rules intended to protect internet users from this sort of interference. Here’s the better news: You can tell them what you think about that. As expected, the FCC voted 2-1 earlier today to start considering a rule that would reverse the Open Internet Order of 2015 and consign its consumer protections to the scrap heap. They may not favor some internet traffic over other internet traffic in exchange for consideration of any kind — no paid prioritization or fast lanes. In order to do that, the FCC had to reclassify internet services as telecommunications services under Title II of the Communications Act, making them common carriers like phone companies. In the same way that your copper-wire telephone carrier couldn’t block you from dialing AOL or charge you extra for calling CompuServe 25 years ago, your cable or wireless ISP can’t block you from using Netflix instead of Hulu, or charge you extra for reaching Google instead of Yahoo. However, Pai’s proposal seeks to undo that, by removing Title II classification for ISPs. Without that legal underpinning, the law falls down. Pai is also seeking comment on whether or not those bright line rules should even exist at all. Luckily for the public, one required step of the lengthy process for considering a new rule is a public comment period. 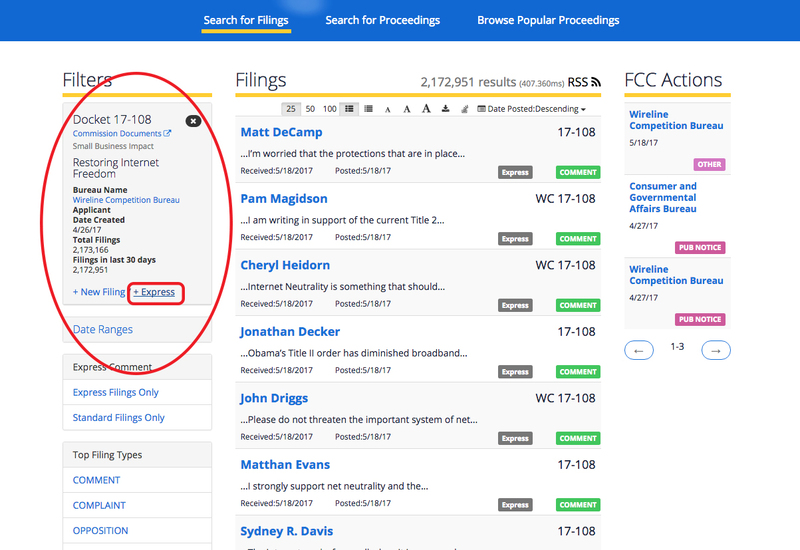 You, the public, have from today until JULY 17 to submit your comment on whether you support or oppose the FCC doing this. If you’d like to lodge a comment, read on. That link will take you to the system where you can submit a comment. 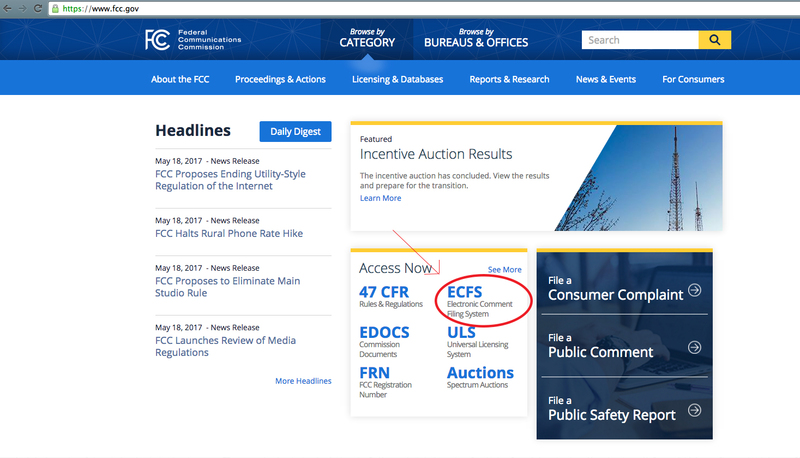 You’re looking for ECFS, the Electronic Comment Filing System, because what is government without acronyms? When you start typing, the form should suggest the right docket to you. 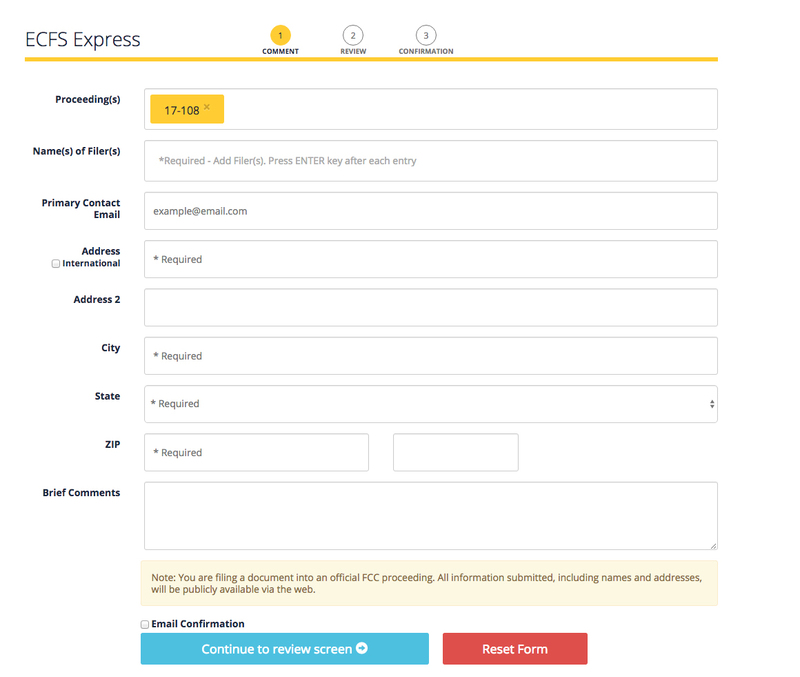 This link will take you directly to the comment form you can fill out to submit a text comment in this docket. It’s over on the left, not as obvious as you’d maybe expect. 5. Fill out the form. The fields of the form are pretty self-explanatory. You do have to fill out all the fields and, please note, they are viewable by the public online. If you want to receive an email confirmation when your comment is received, click the “Email confirmation” box near the bottom. When you’re all done, make sure you click the blue button that takes you to review your comment. 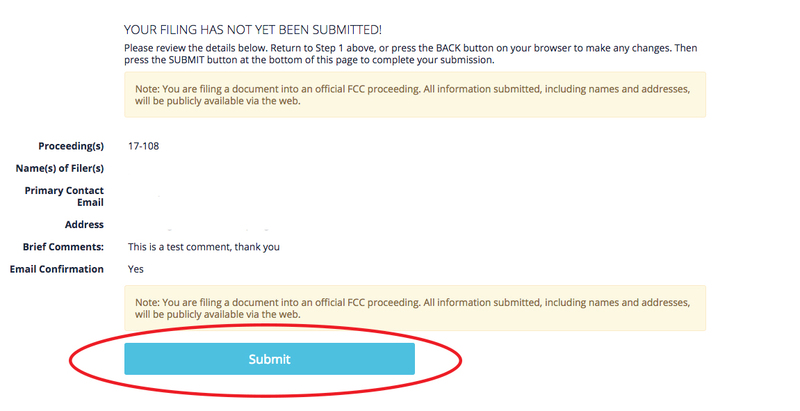 If you’re satisfied with what you see, make sure you click “Submit” to get your comment in the docket! No, we didn’t submit this test comment — but you should submit your real one! Not sure what to say to get counted, or how to say it? The advice we gave in 2014 still holds true today: just think about what matters to you. If you use the internet at all (and you do! ), you have your own reasons for wanting to make sure you can still manage your life online in the way that best suits you. If you think the FCC’s plan to let the biggest of the big companies spend more money to limit your access for you isn’t harmful to your goal to just keep on doing your thing, that’s what the FCC needs to hear. Be relevant. We know: you’re frustrated with a lot of things having to do with your cable company, your wireless carrier, or the internet at large. But they aren’t all at stake here. Stick to the actual NPRM. Be honest. If you actually do use the internet to provide for 37 orphans’ education every day, then by all means say so — but you don’t need to pretend to have concerns you don’t. Your real consumer concerns are valid just the way they are. Be clear. What is it you actually want? Who do you want to do it? Be very clear with what you ask, and also with your reasons for why. A one-liner isn’t enough; a 5000-word essay is much too much. Be you. Public comments are public record, and we get it can be scary to attach your real name to that — but a fake name is going to lead to whatever you say being considered a fake comment. Own it. Use bad language. We get it: we feel pretty strongly about this, too. But don’t use words you couldn’t say on prime-time broadcast TV. When in doubt, imagine if you had to read it to your significant other’s grandma. 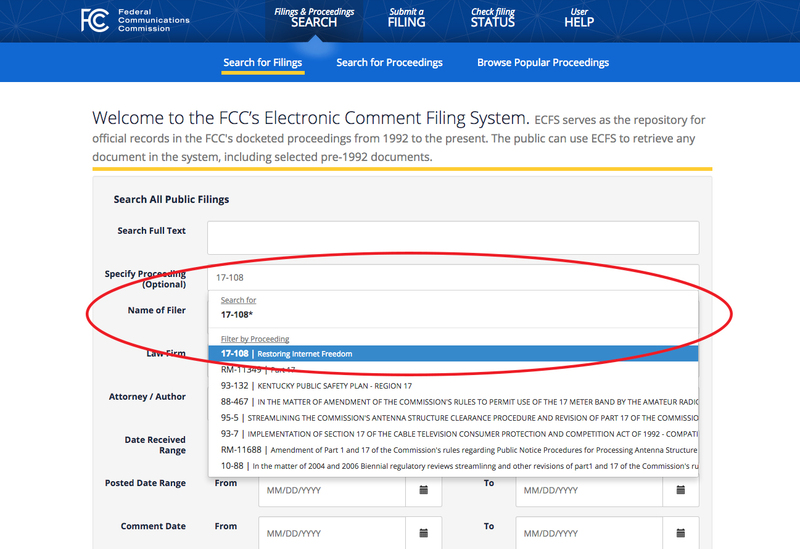 As much as you might want to, dropping the F-bomb (and its many, many, many creative variants) into a comment is not going to convince anyone at the FCC to change their mind. Get personal. It doesn’t matter what you think of Chairman Pai, the CEO of Comcast, or that guy next door. This isn’t a place for ad hominem attacks; you need to talk about the proposal at hand and leave your opinion about others’ personal attributes out of it. Use fake information. Like we said: A public comment is a public record. To have your voice taken seriously, you need to make sure it’s labeled as your voice. While everyone expects a huge volume of comments to come pouring in — and indeed, as of this writing ECFS says more than 2 million already have — quality, over quantity, matters even more than usual this time around. John Oliver once again kicked off a tide of comments by discussing net neutrality on his show, Last Week Tonight, earlier this month. And while many of the comments were perfectly fine, the language he chose to promote the initiative — gofccyourself.com — as well as the language he uses on his show inspired many net neutrality supporters to be less than polite in their filings. Other comments also employed racist language against Chairman Pai or used false names (including Chairman Pai’s), and he and the Commission have already been using those to point to a wide swath of feedback as invalid. Meanwhile, not only are form letters pouring in from both sides, but also apparently robot spam using names stolen from data breaches is pouring in to the system at an alarming rate. Reporters asked Pai today at a press conference about the contentious developments with comments for this proceeding. Pai pointed to thousands of total comments filed under false names — including “John Oliver,” “Wonder Woman,” “Mickey Mouse,” and his own — and those full of invective as, basically, useless. “Those are not going to have an impact,” he told the press. Reporters also asked about the robot comments, and how the Commission plans to handle those in the future. Pai largely deferred to the FCC’s IT team as the experts, but said, “Obviously, there’s a tension between an open process and preventing questionable comments from being filed.” Usually, he added, the Commission errs on the side of openness — but because of that, fake comments are sometimes going to happen.